Some plants tolerate poor soils and most people agree that over-feeding pelargoniums results in too much leaf growth and not many flowers. Other plants are better with feeding. 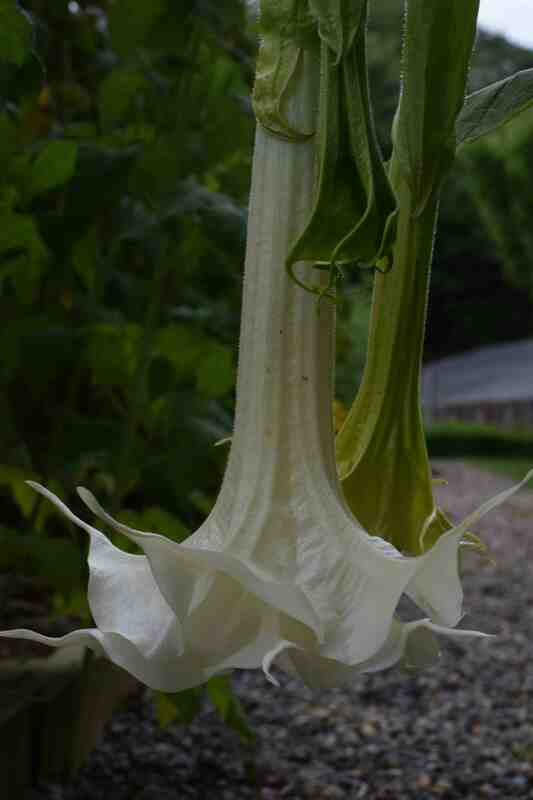 But brugmansias demand lots of feeding. I know no other plant that shows its displeasure when hungry and rewards so wholly when its gargantuan appetite is satisfied. To prove the point here are two photos. Admittedly they are two different varieties but they were the same size when I received them in the post last summer. 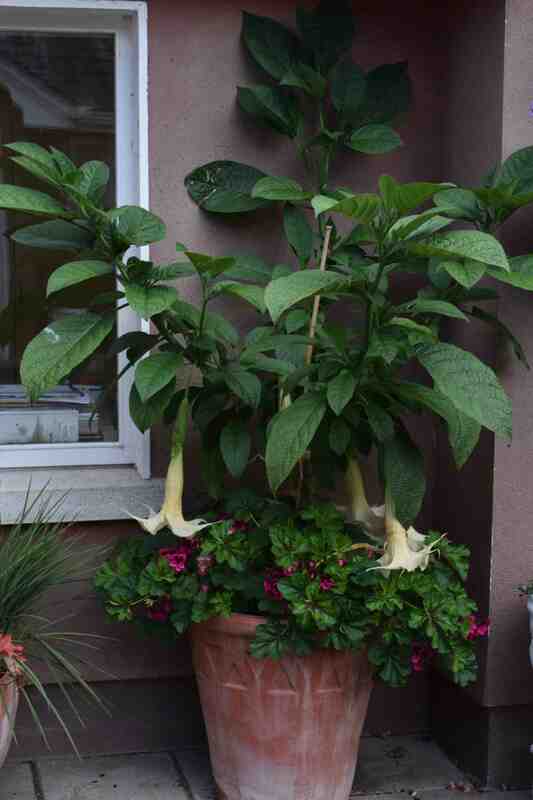 They have had exactly the same treatment apart from the first has been potted into a huge pot of compost and the second is in a much smaller pot and, although fed every week with a general plant food is showing how bad your brugmansias can be if you don’t treat them right. The first plant was in the same size pot as the second but, in May was potted into this huge pot. The compost is a mix of multipurpose and John Innes No 3 (about 60% to 40%) with slow-release fertiliser added. In addition, every week it gets a two gallon can of dilute fertiliser (it needs that can of water every day at the moment). But what has really put a rocket under it is that, as an experiment, after putting 15cm of gravel in the base of the pot for drainage, I put in a 30cm layer of ‘mushroom compost’ – the evil smelling stuff that scorched the tomatoes in the greenhouse. My thought was that by the time the roots got down to it it would have calmed down a bit and not cause any damage. 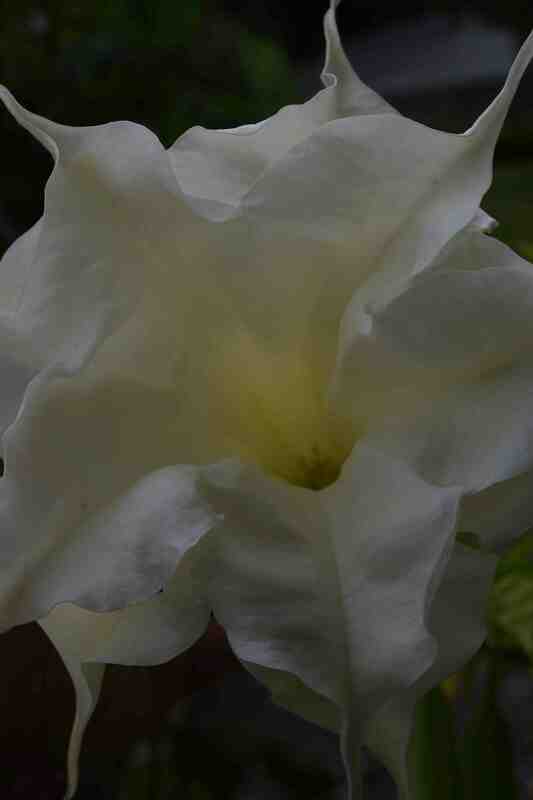 I am pleased to say I was right and the plant has grown amazingly and there are lots of blooms. In contrast, the unpotted plant looks utterly dejected. 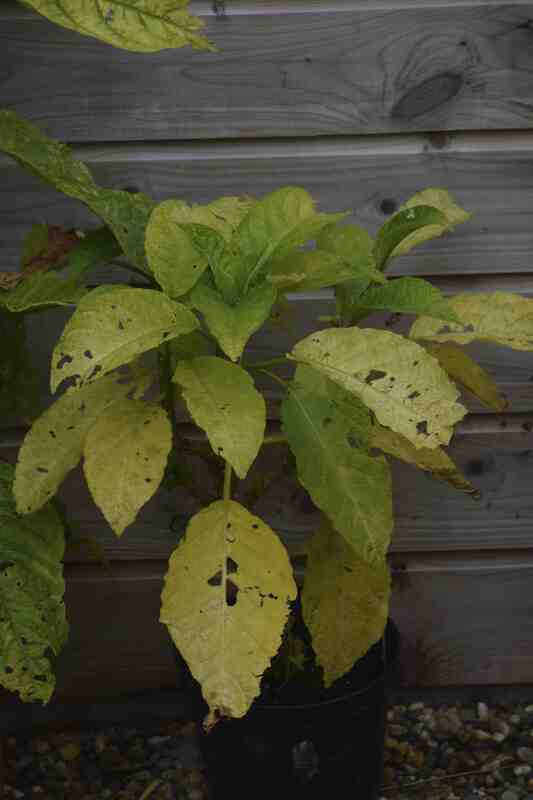 To reassure you, this is the worst of the lot and I will pot it soon – I do not routinely torture plants. But I thought it showed how important feeding is for these amazing plants. And to make up for the last image, another of the ‘brugs’ is now flowering well. 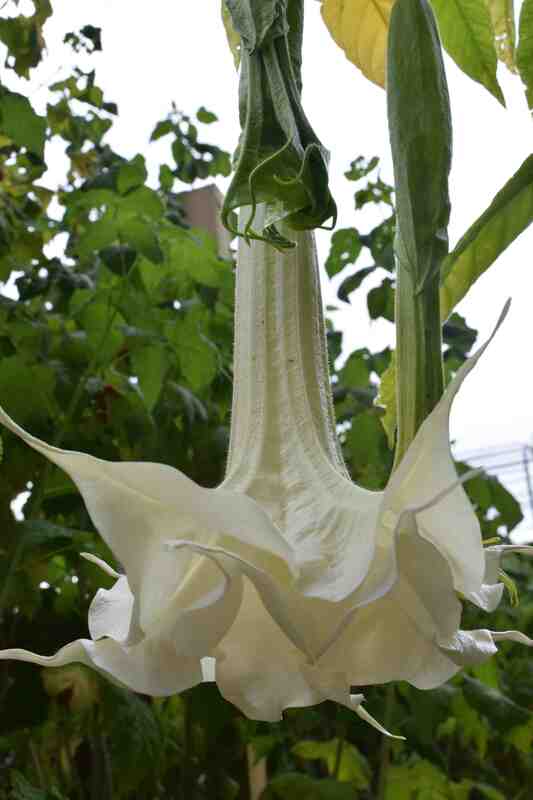 This is ‘Angels Fantasy’ and it has huge, duplex blooms in pure white. I think this is the biggest so far and 40cm long, with one flower inside another. Scented too. I can see why they’re called Angels Trumpets, but to me they also look look like ball gowns!